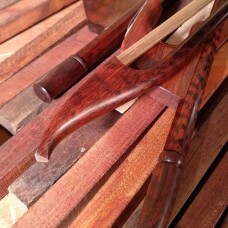 Selected round snakewood stick, snakewood frog & button. Natural horse hair. 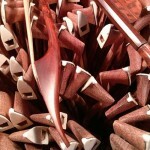 1st grade snakewood baroque shafts are strong, light weighted. 1st grade snakewood frogs & buttons, we use finest polished snakewood without any kind of dying or painting to make this bow frog & button. 1st grade of natural white horse hair from a male horse, without bleaching or dying. 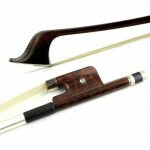 How to choose violin, viola, cello, double bass bows? A precise band saw is used to cut woods into blank pieces. Milling machines are used to give the stick blanks a rough shape. Different kinds of planes are used to give completed shape of the shaft, and mean while the burning heat source is used to form the camber. A series of files are used to give shape to the bow tip. And sandpapers of different grits are used to polish. A good combination of balance and weight are the final goal. We re-categories the shafts by their quality in each step, so that we have enough semi-finished sticks for each grade at different crafting steps. Shafts are finely varnished by hand to meet their grades. Click to see making process. A precise bench saw is used to cut ebony (or other materials) into blank blocks. Special milling machines and lathes are used to shape them. Files and sandpapers are used to polish and finish their shape. Their grades are categorized by smoothness of the wood surface and natural color of the wood, and then ready for fitting onto the shaft.Click to see making process. Shaft, Frog/Button and Horse hair, fit them together, seems like just a rehair process. We use our special procedure to ensure the assemble quality, especially the right length of the horse hair.Click to see making process. 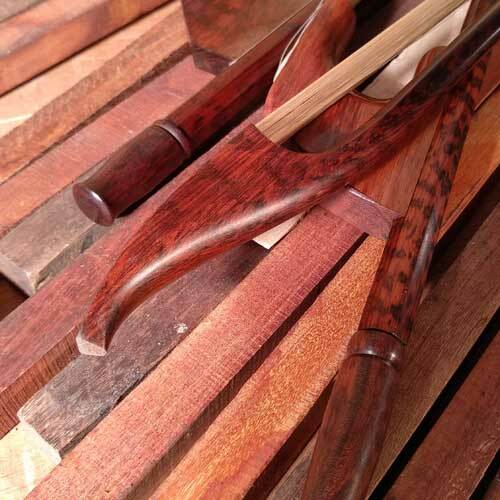 Whether you are looking for a custom-made bow or standard bow, please let us know what you want for a bow such as the acoustic properties, the flexibility of the stick, strength, weight, stability, and the playing qualities that you desire. Please contact me regarding our handmade bows. I look forward to discussing your needs for bows. Crafting time normally less than one week.